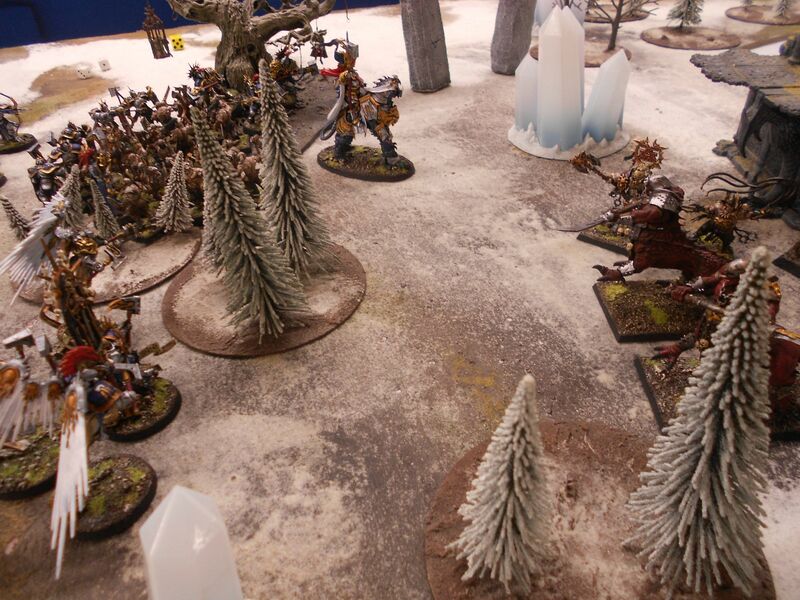 The army moved as fast as it could, Barthust sent some of his men in a wide sweeping arc around the gathering force of Bloodbound warriors now clustered around the Balegate. He surged forward on his Dracolith, Prosecutors following immediately behind. 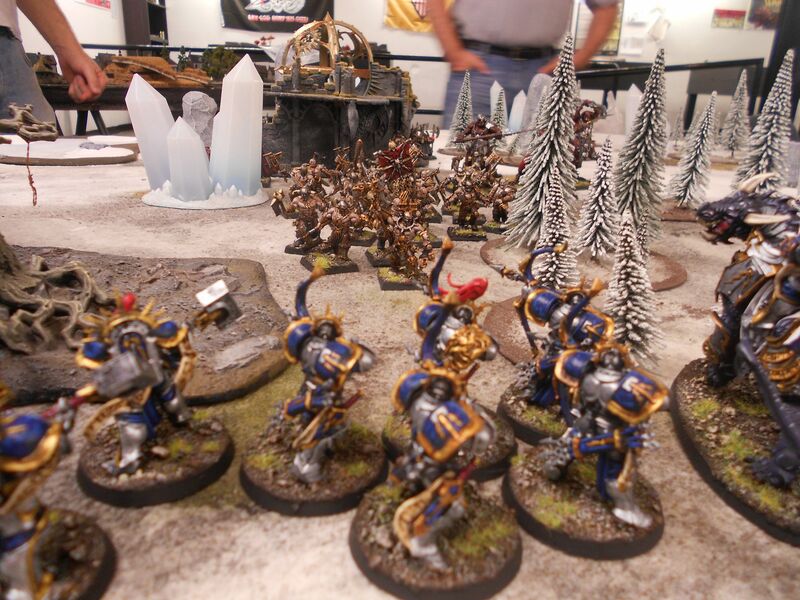 His archers spread out behind him and as he pulled up short in nearly charge distance of the Chaos force the archers ran in front. No sooner had they done so than a shout rang out from the blood thirsty murderers and they charged forward into the archers who quickly pulled back. Liberators charged forward through them and into the berserk reapers inflicting heavy casualties on the severely outclassed mortals. 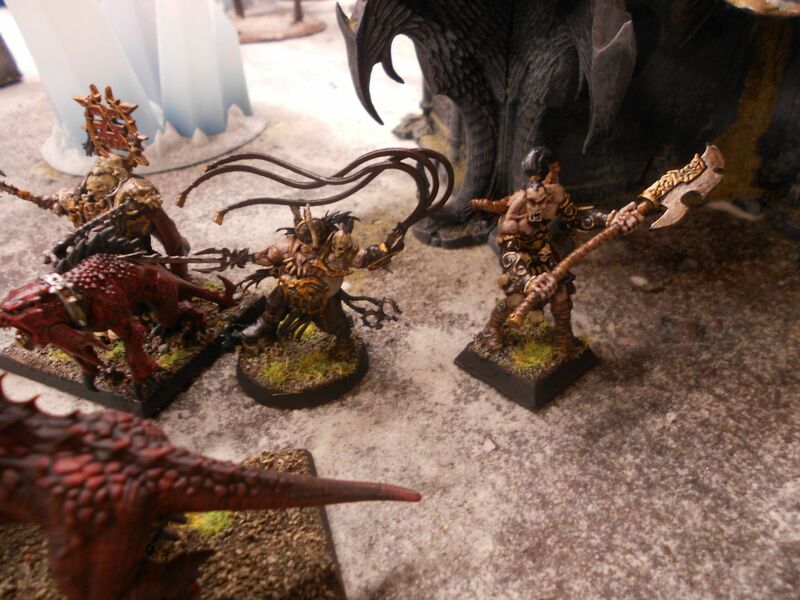 Barthust plowed through the warriors and several Dragon ogres moved to intercept him, largely ignoring the blows the behemoths' glaives rained down on him he smashed past them and leaping his Drcoth onto the artifact brought his hammer down repeatedly on the metal sphere, each blow denting in the metal sphere. 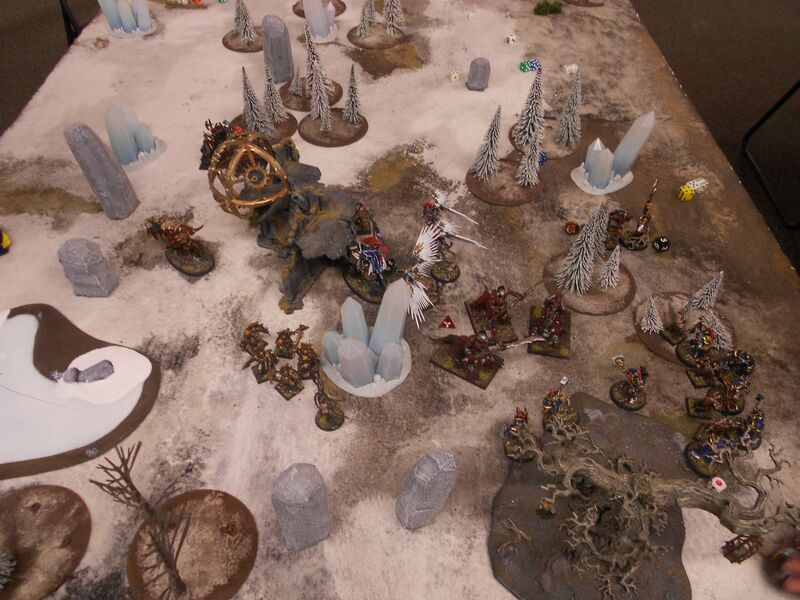 As the prosecutors flew over the Chaos lines they added their hammers to the blows raining down on the artifact. 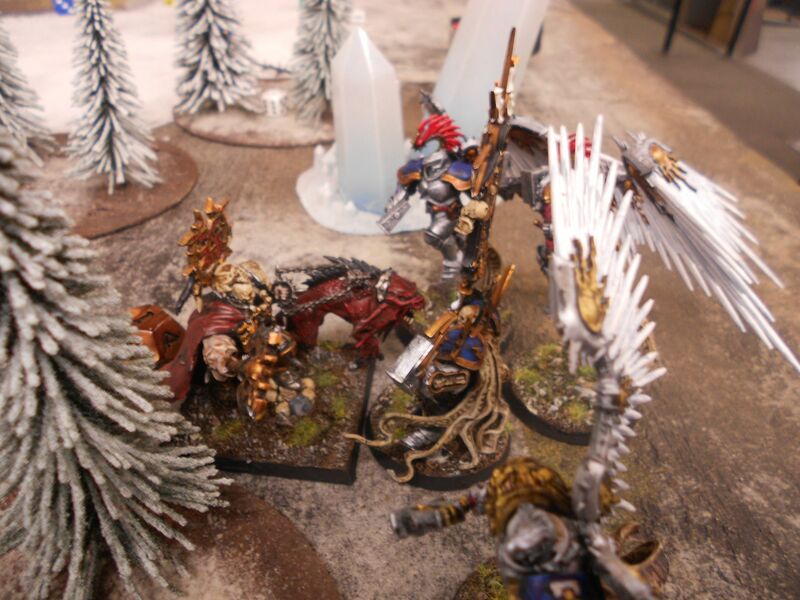 The Lord-Celestant brought his hammer up one more time, the forces of Khorne were closing in now. The hammer fell and the metal sphere broke loose from its moorings and rolled along the ground towards several Blood warriors who were smashing the last of a unit of Liberators to pieces. The threat ended the Dracoth leapt over the approaching warriors and the prosecutors took to the sky. 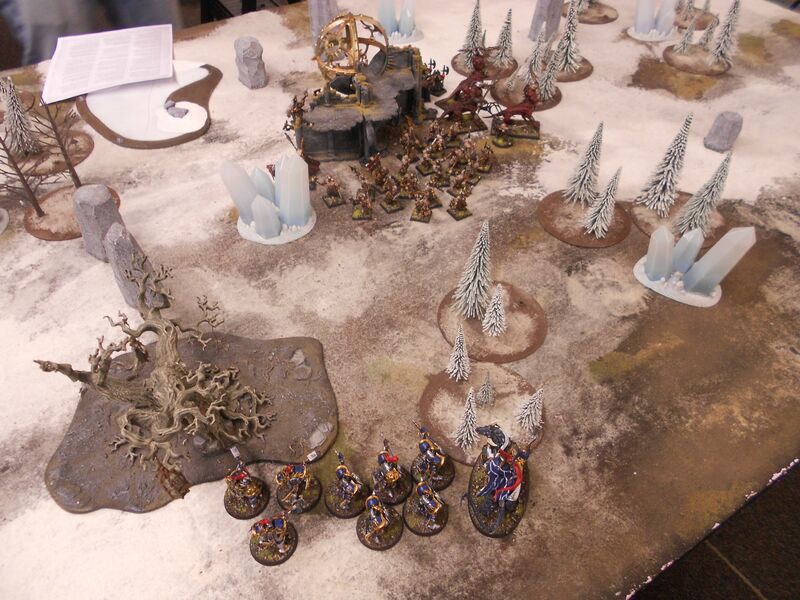 The rest of the Sigmarite forces fought off the remaining Khorne warriors and retreated. A number of brave warriors had died, but destroying the portal would prevent any daemonic reinforcements arriving for the forces of Khorne. They could now be tracked down and destroyed. This was the Pre-Emptive Strike scenario from pg. 205 of the rule book. The Khorne force had the boxed set stuff without the Blood Secretor but added a Slaughterpriest, three dragon ogres and a unit of Chaos warriors. The special ability of the general to move through enemy troops was pretty powerful, he just pushed through the Reavers and the Dragon ogres. The game was over pretty quickly due to the Chaos forces not being able to make almost any saves once the objective was attacked. Once the attacks started the gate was destroyed on that turn. Which is impressive since it had 8 wounds with a 3+ save and there were 18 attacks directed against it.